My third visit to a recording of Gardeners' Question Time last week didn't disappoint. Eric Robson was in the chair (hurrah! ), with Matthew Biggs, Anne Swithinbank and Chris Beardshaw ready to answer our questions. I went on my own this time, but that didn't matter as there were plenty of people to chat to during coffee beforehand and whilst we took our seats. I met a mother and daughter celebrating their birthdays that day, plus I sat next to a couple who were at the same recording I went to three years ago. 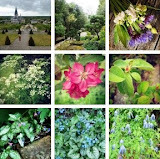 All manner of plants and photographs were clutched by prospective questioners, all hoping to be called down to the front row of seats reserved for those chosen to pose their query. Producer Dan reassured everyone, 'If you're not chosen, it doesn't mean you're a bad gardener'. I don't usually go for coleus, but these three simple pots round the corner catch my eye every time I go past them. They're placed below a window at the end of a drab drive, with colours that blend with each other well and also complement the brickwork of the house. This photo was taken on a dreary day and their fieriness helps to lift the gloom. I think they're fabulous, how about you? Update October 4th 2016: It looks like the outer coleus are a new cultivar called 'Campfire', spotted amongst 56,000 seedlings at the University of Florida in 2012, or possibly 'Redhead'. It depends whether the orange of 'Campfire' has intensified, like the blurb in this month'sHTA News says it does. This is a tender perennial of hardiness H1C which means it can be grown outdoors in the summer. Update same day: Ball Colegrave introduced these onto the UK market this year, so I was able to get their American company to confirm the cultivar via Twitter. This scene makes me smile every time I step out onto the patio. A couple of the spare trial garlic cloves I planted for green garlic developed a scape, then from these little miniature garlic cloves called bulbils formed. Now these have started to sprout and they look like they're having a bad hair day. I love them for it. I'm not sure which of the varieties they're from as I planted the spares in a random fashion in their pots. I suspect the humid weather over the past few weeks has encouraged the bulbils to sprout and their obvious viability means I'm having a go at bulking them up into garlic suitable for cropping. Bulbils are usually dried and stored much earlier in the year, but seeing we're close to autumn garlic planting time, I see no harm in a little experimentation right now. There's just over a week left to visit Wyndcliffe Court before it closes to the public for good and I'm pleased NAH and I took some much needed time out to hop over the Severn Bridge to see it earlier this week. I find a trip over water - no matter how brief - always feels like a holiday, especially as we went 'abroad' into Wales this time. We arrived just as a group of artists were finishing their morning of sketching and painting, and we enjoyed our view of one of them beavering away whilst we relaxed over our lunch. Much of the summer floral colour had finished and autumn was just beginning to show its hand, but Wyndcliffe Court is an Arts and Crafts house and garden, with plenty of structure and garden rooms to provide lots of interest for our visit. This is the sunken garden and summerhouse. I'm pleased with the performance of the Petunia 'Night Sky' plants I've trialled this year. It was my pick of the bunch when I visited Thompson & Morgan in 2015, and that early promise hasn't disappointed up close and personal back at home. Plants were quick to bloom and they've come back from some gross neglect on my part as I left them to flounder in 9cm pots for far too long. I finally got round to planting up my hanging basket in mid July, cutting back my stringy, yellowing plants to the first leaf (some of which were extremely scrappy) and as you can see, they've revived spectacularly. This is another photo from our visit to Helmsley Walled Garden earlier this year. Fortunately, NAH was happy for me to have a wander round the garden and take plenty of time to stand and stare. 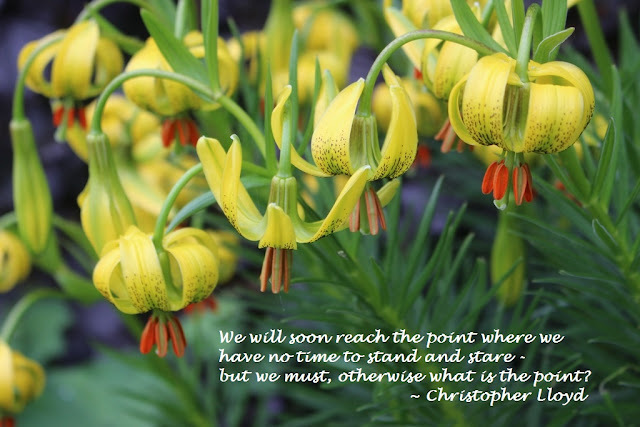 The quote was on one of the blackboards at the garden entrance (see July's Muse Day for another) and it seemed appropriate to transfer it to a photo of my first closer view of these lilies. I've only managed to see them at a distance previously. Where's your favourite spot to stand and stare? I also like warm summer evenings here in the garden, watching the bats zoom around at dusk.